The BORDO™ 6000 Folding Lock TwinSet with four keyed-alike keys guarantees maximum security and even greater versatility. Place your trust in the quality of the classic model twice over, and benefit from the additional possibilities. 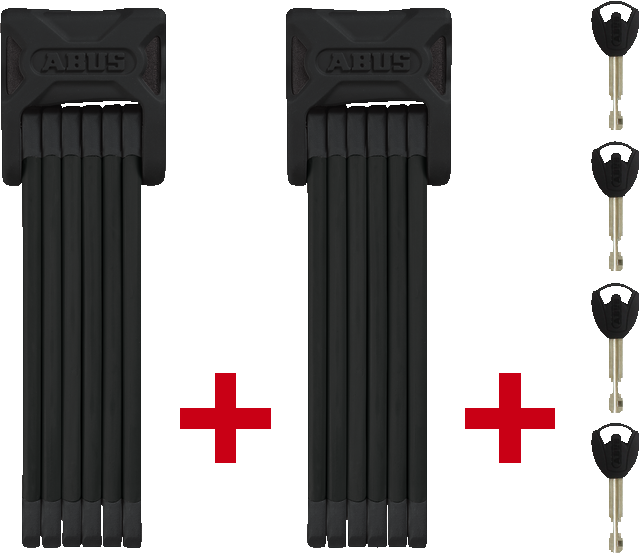 There's no denying the outstanding functionality of the folding locks in the ABUS BORDO™ range: their combination of sturdiness, flexibility, weight and compactness makes them a must-have for any cyclist. The BORDO™ 6000 Folding Lock TwinSet raises the bar even further: the two keyed-alike locks can be combined to make an enormous total length of 180 cm. The locks are supplied with four identical keys, avoiding the extra charges that would normally be incurred for the keying alike of two ABUS locks purchased separately. The TwinSet therefore expands yet further the practical flexibility of the individual BORDO™ 6000 Folding Locks.